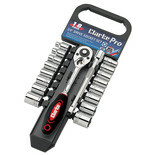 10 AF sockets - 15/16", 1&1/8", 1&3/16", 1&1/4", 1&5/16", 1&3/8", 1&7/16", 1&1/2", 1&3/4"
The Clarke CHT263 Socket Set is a mixed socket set, particularly suited for use on larger automotive and agricultural equipment. 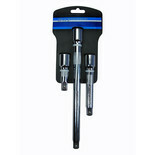 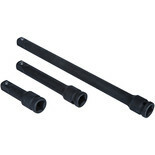 A three piece socket extension bar set, complete with 3 1/2" bars in sizes 3",5" and 10" for use in hard to access areas. 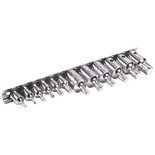 Manufactured from durable heat treated and hardened chrome vanadium steel. 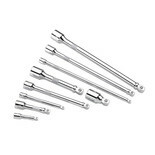 Set of 9 Chrome Vanadium Wobble Extension Bars for 1/4", 3/8" & ½" Square Drive Sockets, Knurled section for improved grip when fingers are oily. 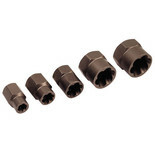 Sockets can be driven with shaft offset by up to 10º. 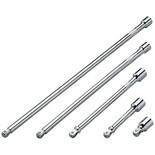 A set of five chrome vanadium steel, knurled ring extension wobble bars that allow greater access to difficult to reach fasteners. 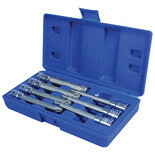 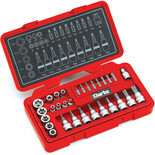 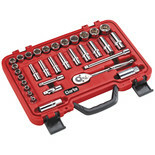 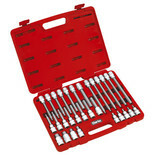 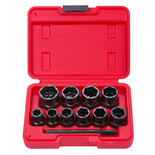 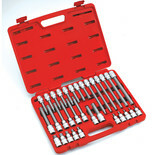 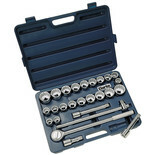 This is an excellent ¼” and 3/8” mixed set for use with Torx headed screws and sockets. 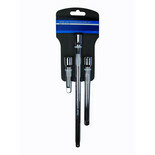 It is manufactured from chrome vanadium and has a great range of sizes suitable for various applications.